While we’re still waiting for the next major version of Windows 10 to be released, which now will apparently be called Windows 10 April Update, we’ve also seen evidence of new features that will come in later updates, including a new cut-down version of the operating system known as Windows 10 Lean. According to a Twitter user named Lucan, Windows 10 Lean will be a new installation option when you install Windows 10 from scratch. 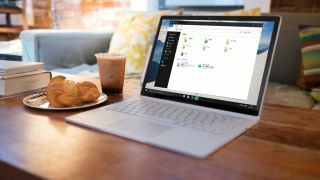 The new edition is available in an early version of Windows 10, build (17650), which can be downloaded by Windows Insiders who have chosen the ‘Skip Ahead’ feature. It looks like Windows 10 Lean will be a 64-bit version of Windows 10 that is 2GB smaller than Windows 10 Pro, with a number of features cut to save disc space. This means wallpapers, drivers for CD and DVD drives, and a number of apps have been cut. In this early version, Lucas also found that Microsoft’s Edge browser doesn't show download prompts, which means you can't get files from the internet, making it even more restricted than Windows 10 S.
So it looks like Windows 10 Lean will be aimed at devices which have limited resources, and where security is a priority. It’s good to see Microsoft targeting hardware like that, but the ever-growing list of Windows 10 varieties is quickly becoming confusing. Another upcoming feature was also unveiled on Twitter, this time by Rafael Rivera, a software engineer, who found that a dark theme is coming for File Explorer. This makes the windows you use for browsing the files on your computer a better match for any theme you have that uses dark colors. While it’s not a particularly groundbreaking feature, it is one that quite a few people have asked for in the past. Again, this is an early version of the feature, but if you fancy trying it out Rivera has creating a hacking tool known as Mach2 that will allow you to enable it. Of course, we always advise that you take care when using such tools.